Long ago, before colleges and universities, the only way to learn a skill was by following another person around and learning the skill directly from them. This form of learning was known as an apprenticeship. Today we more commonly refer to this practice as on the job training. The education industry has grown and improved so much from the times of apprenticeships. We now have a variety of choices when it comes to learning a trade. Let’s discuss a few of them and learn more about on the job dental assistant training. Formal education training involves learning by sitting in a classroom. This type of learning will use methods involving textbooks, lectures, notes and test taking. This type of learning can be beneficial as you will learn a lot of important information. However, it can be tedious with lots of memorizing. And if the job you are training for requires that you perform a task, it will not be as helpful to simply memorize how to perform it. Take riding a bike, for example. You can memorize where to put your hands and feet and what motions you should make with your body. But the only way you can learn how to ride a bike is by getting on and performing the task yourself. On the job training is where a person learns the skills they need for a job as they perform it within the work environment. They are often trained by a co-worker or other supervisor on the job site without any former training. They will learn the skill as they go along. This type of learning can be good as you will learn how to work with the exact equipment and environment that you will always be working in. Studies have shown that on the job training is a great way to learn a new skill. On the job training is most often used within a company for training for promotions such as manager positions. It is also widely used for specialized training to all employees on a new system or job requirement. However, some companies don’t have the time for on the job training. When they hire an employee they expect the person to know what they are doing. Hybrid training involves some parts of all types of learning. This can include formal classroom instruction, on the job training and hands on learning. On the job dental assistant training is not the best way to learn. We want you to be confident going into a new job and know exactly what you are doing. On the job training alone is not enough for a dental assistant. The American Institute of Dental Assisting believes that students learn best in a hybrid learning environment. That’s why we teach the important information in the classroom and leave the hands on learning for our live clinics. We teach you how to use all different kinds of equipment and software and let you practice on live patients with real dentists by your side. We offer interactive hands on learning. 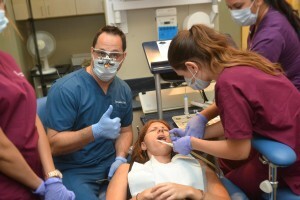 It’s like having on the job dental assistant training ; you will get to use all of the same equipment hands on and be in a dental office environment. But we do it before you get to the job so that you will walk into your first job knowing exactly what to do and how to do it. We take pride in training high quality dental assistants.